From the I'm swine flu for Halloween department... Happy Halloween everyone! 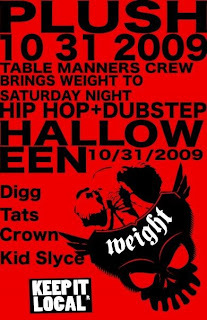 Table Manners Crew @ Plush tonight, Oct 31st! 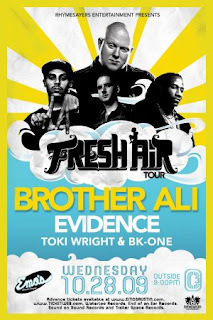 Ali Newman (born Jason Newman in 1977), better known by the stage name Brother Ali, is an American hip hop artist. Brother Ali was born in Madison, WI, and spent his early childhood moving from city to city in the midwest (mostly in Michigan). Ali’s family settled in Minneapolis, Minnesota, in 1992. He attended Cooper High School in New Hope, MN. It was in Minneapolis that Ali converted to Islam and was given the name Ali (he was born Jason Newman). Brother Ali now lives in South Minneapolis, where he continues to record. He has a son, Faheem, from his first marriage, and remarried in 2008. From the Dookie department... Crew 54 is starting a new spin off of their 54 Reality Show called Reality Bites. Props and good job guys! "In the effort to make Dookie Vizion Productions and The 54 Reality Show a full scale established media outlet we bring the newest spin off, Reality Bytes. We take the interviews that you've come to love out of the weekly video blog, and give you a chance to get a bit more in these rappers business haha." 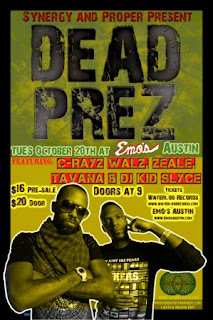 From the back from San Fran department... Dead Prez @ Emo's on Tuesday, Oct 20th! And featuring C-Rayz Walz, Zeale, Tavana and Kid Slyce! Dead Prez is an American underground political hip hop duo composed of stic.man and M-1. They are known for their confrontational style combined with socialist and pan-Africanist lyrics. These lyrics tend to focus on revolution, veganism, institutional racism, critical pedagogy, police, capitalism, education, prison systems, religion, activism against governmental repression, and corporate control over the media, especially hip-hop record labels. Dead Prez made their stance clear on their first album, declaring on the lead song, "I'm a African" that the group is "somewhere between N.W.A. and P.E." Austin, TX - October 12, 2009 - Bavu Blakes and Austin Hip-Hop Scene introduce the only iPhone application that allows music fans to listen to the Bavu Blakes 08IsSoGreat Flow Series from the palm of their hands. 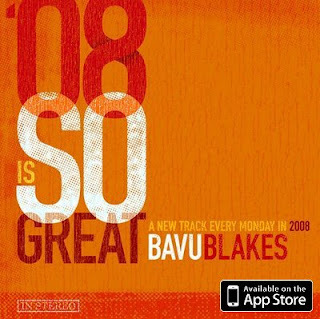 Starting the first week in 2008, Bavu delivered a new flow each Monday of the week and posted it to 08IsSoGreat.com. In total, Blakes produced 52 flows that will have your head bobbing and body dancing to a sound so smooth, you'll be groovin' for hours. The application, "08IsSoGreat", enables music lovers to enjoy the great body of work created by Bavu Blakes. "Caught Bavu Blakes at a club in Austin, TX, a few weekends ago and was completely in awe at his talent," says kt512. "So this app was a no brainer. Imagine for a sec... 52 songs in '08. Definitely no easy task. Great app and idea to promote artists. If you love hip-hop you'll definitely love this app." Austin Hip-Hop Scene is the premiere website to find out about Austin Hip-Hop music. The website features local Austin Hip-Hop artists, music, shows, art, reviews and more. Pellucid Solutions, LLC is a software company specializing in helping music fans and artists forge connections through software. 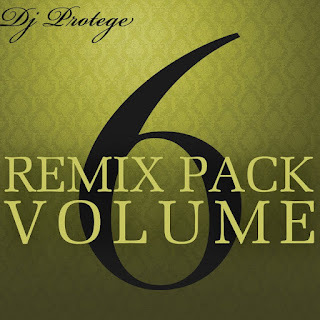 From the Reading Rainbow department... DJ Protege puts out another Remix Pack Vol. 6! More free music to have jammin' in your iPods! Listen to it below and leave some comments letting him know what you think! Take a look, it's in a book - Reading Rainbow. Reading Rainbow, Reading Rainbow, Reading Rainbow, Reading Rainbow! 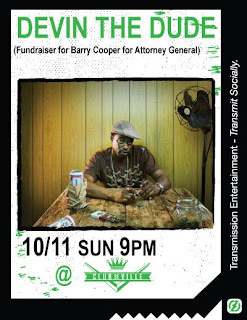 From the well enough department... Devin the Dude @ Club Deville on Oct 11th! After a full week of battling with the flu, I think I'm finally well enough to step out of the house and not be a threat to society. It's been a long week. Devin Copeland, better known by his stage name, Devin the Dude, is a Houston hip hop artist. He is best known for his unique rapping style and his long career signed to Rap-A-Lot Records as well as his 2002 song Lacville '79. In 2008, he ended his 15 year relationship with Houston based Rap-A-Lot Records because the label failed to renew his contract. Later that year, he signed with indie label Razor & Tie. 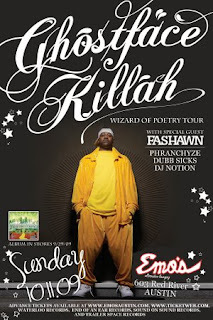 From the Nobel Prize department... Ghostface Killah @ Emo's on Oct 11th! I always believed Obama would eventually be awarded the Nobel Prize. Question is, does he deserve it this early? Dennis Coles (born May 9, 1970), better known by his stage name Ghostface Killah, is an American rapper and member of the Wu-Tang Clan. After the group achieved breakthrough success in the aftermath of Enter the Wu-Tang (36 Chambers) , the members went on to pursue solo careers to varying levels of success. Ghostface Killah debuted his solo-career with Ironman, which was well received by music critics. He would continue his career, creating additional award-winning albums over the following years such as Supreme Clientele, Fishscale, and The Big Doe Rehab. Ghostface Killah is a Muslim  Ghostface Killah is critically acclaimed for his loud, fast-paced flow, and his stream-of-consciousness narratives containing cryptic slang and non-sequiturs. Ghostface Killah took his name from one of the characters in the 1979 kung fu film Mystery of Chessboxing. 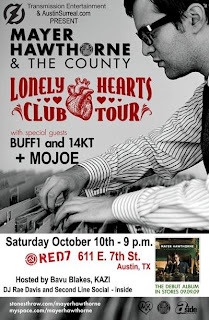 From the I'm sick of the flu department... Mayer Hawthorne @ Red 7 on Oct 10th with special guests Buff1 and 14KT + Mojoe! Austin, let me tell you, the flu is real! This years strain is bad so be careful out there. Mayer Hawthorne (born Andrew Mayer Cohen in 1978 or 1979) is a singer, producer, songwriter, arranger, audio engineer, DJ, rapper and multi-instrumentalist based in Los Angeles, California, USA. The stage name "Mayer Hawthorne" is a combination of Cohen's real middle name (Mayer) and the name of the street he grew up on in Michigan (Hawthorne Rd). "Mayer Hawthorne and The County" is a name Cohen often uses when performing or recording as Mayer Hawthorne with other artists. In Cohen's words, "The County" is basically anyone who plays an instrument or sings on his album. It’s also his band when he performs live. Cohen also performs and records Hip Hop music under the stage name "Haircut", sometimes as part of the groups "Now On" & Athletic Mic League. 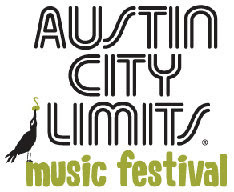 From the playing in ACL Fest mud fun department... Check out Bavu Blakes new music for Smiley Faces featuring Pikahsso! One of my favorite songs, I'm glad to see it put to video. Leave comments and tell Bavu what you think!